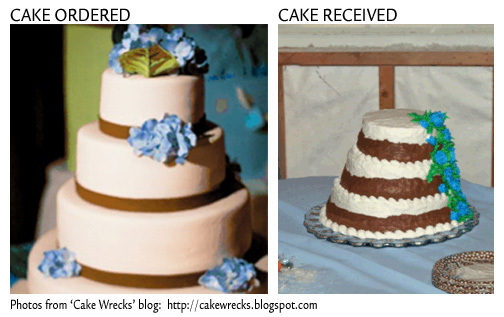 One of my favorite blogs, ‘Cake Wrecks‘ covers a challenge that anyone building or remodeling a home needs to take into consideration. There is often a distinct, visible and potentially costly difference between what you think your new house will look like and how it actually turns out. The reality, when it comes to residential design and construction is quite simple: It is irresponsible to build, remodel or add onto a home if you have no idea what it will look like, and have not carefully considered a full menu of choices in material and color options! Don’t let anyone rush you! This is a major investment, and you should have time to weigh all of your options. Other parties might benefit from rushing you into a home plan you’re not fully comfortable with, or threaten to delay your project behind other projects if you don’t build within x number of weeks. We’ve heard them all. If that is truly the case, then let it be. There are plenty of other builders to choose from, and someone will work within your schedule and comfort level, not just their own. This is arguably the most important bit of advice to avoid a Home Wreck. Here again, we run into the rush-rush scenario, where some parties can save themselves money by rushing you through the process of home design. The quicker they can get you to agree to a plan – no matter how preliminary it might be, the more freedom they will enjoy, and the less design restriction they will have to work within. You are sitting in the back seat of the process, when you should be the one driving. Many contractors work with a drafting service or a lumber company’s in-house drafting team to draw dimensioned plans they will use to get permits, generate bids and ultimately build the home. This is perfectly fine, and very common. But you should, at the very least, be given the opportunity to meet with the drafting team on a regular basis to review their progress and provide your feedback. Again – this is a huge investment, and it is your right to see that the home is designed the way you want it, and you should be given the opportunity to share your thoughts, ideas, and concerns. This will be your home, and you’re the one paying the bills. You have the right to be a part of design development. The more construction detail your blueprints include, blueprints, the more control you – the homeowner – can retain over what the end-product looks like. If you are working with a construction team that includes reputable craftspeople, you *might* be able to trust their expertise in providing a providing a quality build that meets your expectations in the absence of a design team working on your behalf. However, even the best builders require detailed drawings, since they too recognize the importance of making sure everyone is on the same page. Demand to see the design in 3D! It is simply irresponsible to build a home design if you have no idea what it will look like. If you can’t visualize what the home will look like by reviewing 2D plans and elevations, request or hire someone to sketch or illustrate your home in 3D. Look up ‘architectural illustrators’ in the yellow pages or online to find people who can provide this service. Consider the cost of this service on balance with the risk of investing hundreds of thousands of dollars in a home that might look odd (it happens all the time!). Many design teams will include 3D illustrations as an integral part of their process. Consider this when weighing the decision of whether or not your project would benefit from the counsel of a design team. No matter what anyone tells you, it is your right to examine multiple options of material choices and colors. This is yet another area in the construction process where some parties benefit and profit from keeping you in the dark about the full spectrum of choices available to you. A good design team can take 3D illustrations and show you what several options for material and color choices might look like. As you move forward with your construction plans, remember that this could be the single largest investment you will ever make, and it is your right to have a clear picture of what it is that you are investing in. Great post, very helpful for those of us considering building in the near future. Thanks. This is very helpful, not only on the client-side perspective, but also for anyone looking to further their draughting/architectural knowledge on what a client wants regarding the blue prints of their home. I must admint, I do the odd drawing job here and there, and never gave this much thinking, since I do only sketch plans. I can use this to further myself.